Literally millions of Audio Professionals all over world have used Beyerdynamic Headphones since it has been introduced in early 1980’s. Specially the Beyerdynamic’s DT 990 Headphone series constructed to cater for listening in a wide variety of environments, with variants of impedance and aesthetics. Here I shall be talking about Beyerdynamic DT 990 Pro vs Premium Headphones with same impedance of 250 ohms but with price difference of $100 ! So it is important to know what you will get by spending those precious $100 ? is is really worth it ? Lets begin our review and comparison with simple tech specs table with Green and Orange color highlights for quick understanding the differences, then we talk over in details …. Both Beyerdynamic DT 990 Pro vs Premium Headphones comes with Open back design delivering tight, authoritative bass and sparkling highs (treble). They are tuned to get balanced bass which will not over-rule the mids and highs. If you are a hip-hop lover then the crisp highs still maintaining the softness will make you feel in studio. Just look at the frequency response range over 5 – 35,000 Hz, which shows capability to handle wide range from low to high with high quality drivers. Both are Made in Germany to the with proven history of Quality with consistency. 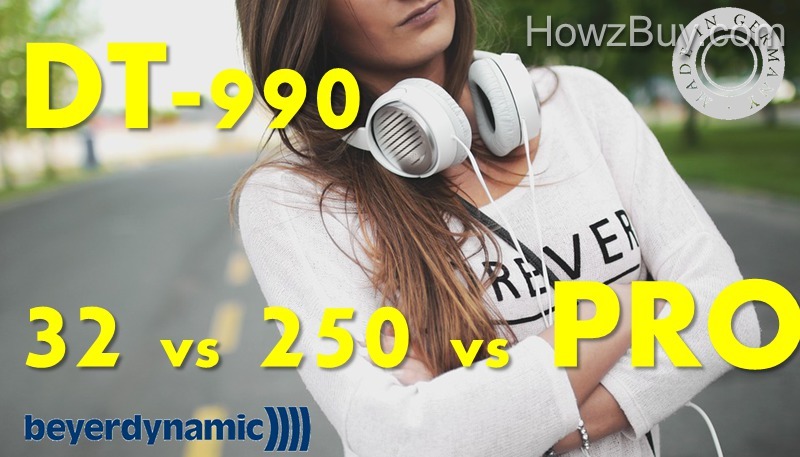 Beyerdynamic DT 990 Pro vs Premium Headphones Whats Different ? The pro version has 0.7 N higher Headband pressure than the premium, some of the reviews say that higher pressure may give you slight discomfort for longer duration use. You may need to test the comfort level with pressure before buying. The Pro version has a coiled cable, whereas the Premiums have a straight cable ! for me personally I like the straight cable more than coiled one ! but its up-to your taste !! The most important factor is if both are delivering almost the same ..